So Inktober has gone on hiatus as I've been working the last few days to find time for my demo reel. Rendering in UE4 has been a bit of a challenge and I've spent a good amount of time with Google trying to figure out why something doesn't work. There are a couple of good shots I have from my renders, unfortunately I can't use them all in this reel and keep it under a minute. That's where the trouble comes. I'm not totally happy with what I have so far, but I still have a little bit of time to keep pushing and polish it up! A still from a render pass I made through the Left Lung Garden in Project Sphincter. Some of the Entertainment-themed models I've chosen to display from my work on Project Arc. Models I chose to showcase from the Dining section of Project Arc. 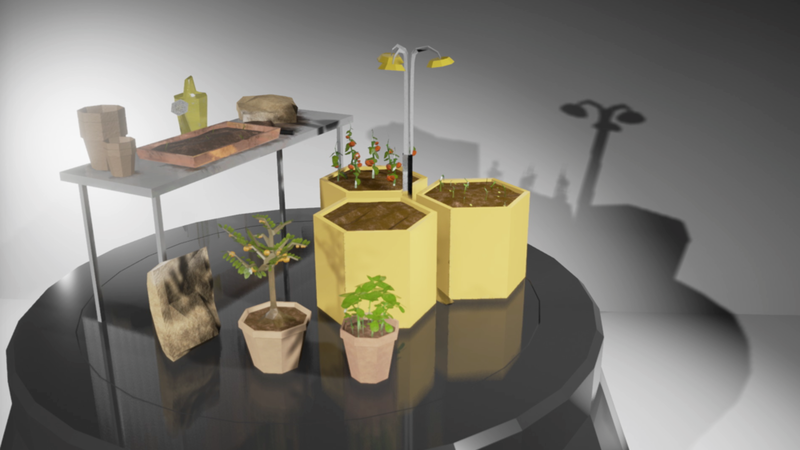 More models I chose to show from the Garden section of Project Arc. A still render from the entryway into the apartment. I've mostly been busy trying to round up models and get them into Unreal, render out a pass, and then get them together cohesively in After Effects. I made great progress tonight, and hopefully by tomorrow night I'll have a new video up on the home page with the renders I've just worked on. I sat down this afternoon to start working on an environment to render my demo reel in. I worked on rendering bits and pieces from Project Sphincter in Unreal Engine 4 this week, and now that I've got the cinematics process down I figured I would just build a new environment to render all my game props in and put it all together. So I modeled this airplane hanger/warehouse type look and started playing with the lighting and materials in UE4. As I started putting the materials together and playing with lighting I got sucked into some of the finer aspects of UE4. Like building glass. I had never really gone too in-depth with the materials editor and I really wanted to see what was involved. I found this tutorial for creating glass HERE and started following it. The results still aren't quite what I'm looking for, but the refraction is at least looking pretty good. I'm hoping to play with it a little more once I've got more of my models in the scene. Screenshot of the materials editor after following the tutorial above. I'll be focusing on another environment project this week but I'll be posting updates from both on here, as well as Inktober!